Editors note: Andreas sent us this update via email. “Ready Soichi? Ready Drew?” I yell out in the semi-darkness. Their helmet lights flicker in the cave, dimly indicating their positions twenty to thirty meters ahead of me. “Ready”, they both yell back. For the next thirty seconds lightning flashes through the cave as Soichi, Drew, and I attempt to illuminate as much as of the cave as possible by aiming our hand-held camera flashes at the walls. The camera, stabilised on the tripod, holds the shutter open the entire time, trying to capture as much of the fleeting light as possible. “Lights on”, I yell, stepping back to the camera to look at the result. There is no way to know if the picture is properly framed or if the focus is right until after it has been taken. It is clear immediately that the left wall of the cave is much too underexposed. Over the next ten minutes, we repeat the process several times, until we are satisfied that the cave is properly illuminated in the camera image. Taking images of the cave is just one of the skills that we have been learning and practicing during the past two days. In addition to exploring and surveying Sa Grutta cave and collecting geological and biological samples, photographing the cave will be one of our most important tasks next week. 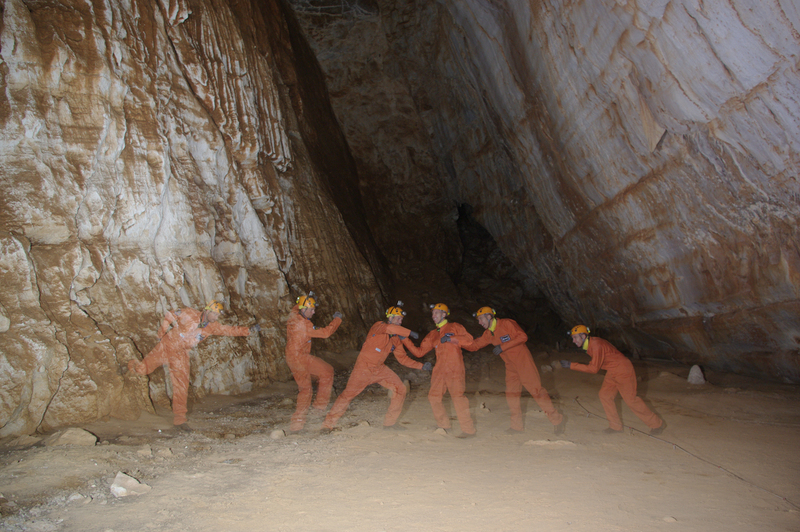 In fact, photography is essential to cave exploration. Not only do the photographs document the survey points and the cave cross section, but they also provide the geologists and the biologists with information about the context in which their samples were gathered. On top of that, taking pictures in total darkness is a lot of fun. Since the camera will not record an image in the darkness even with the shutter fully open, you are free to move around in front of the camera so long as the lights are off. The results are pictures where you mysteriously appear multiple times or pictures with words hanging in mid air and written by the lights of your helmet. 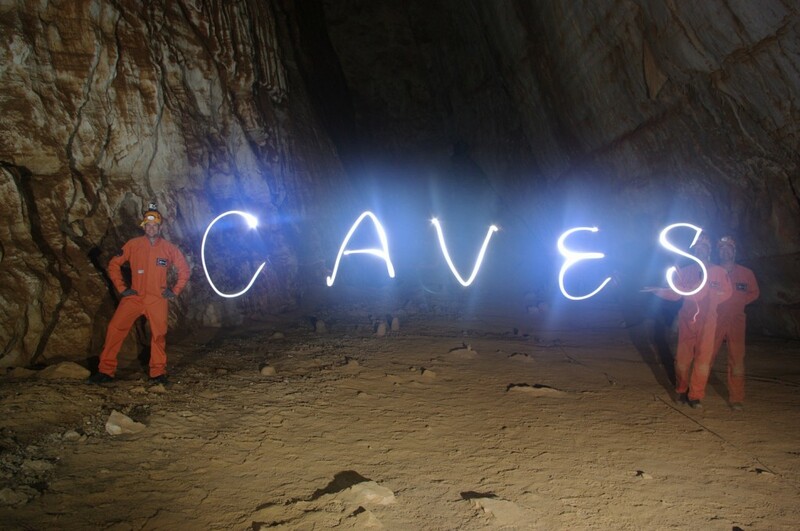 With each new caving skill that we learn, Friday grows closer and closer. On that day, we will descend into Sa Grutta cave, remaining inside for seven days while we explore and map as much of the cave as possible. Our more mundane preparations are also increasing as we approach Friday. We spent a part of today tasting different foods and different meals that we can bring to the cave. The amount of food that we can bring into the cave is limited, as everything will have to be carried on our backs. Luckily, half way through the expedition though, we will receive a resupply from the ground team. But we must plan each meal carefully, based not only on our individual tastes, but also on how much cooking is required, and decide whether to carry it with us or leave it for the resupply. This is almost exactly the same process that astronauts go through prior to their spaceflight. Food tasting sessions are held at NASA and in Star City, allowing astronauts to select from a set list, those meals that they would like to have in space. As a special treat when a European astronaut is on board the ISS, ESA will supply bonus food in addition to the standard American and Russian meals. In preparation for his mission in May 2013, Luca recently chose his Italian-made bonus food of lasagne, caponata, risotto with pesto, and tiramisu. We are lucky enough to have received some samples of his bonus food, which we will also be bringing into the cave with us. The pictures have come out looking great – it must have been fun to take a break from learning to take those! I was surprised to see how much effort goes into factoring in the importance of taste – I would have imagined that the meal plans are based purely on your minimum caloric requirements, considering how much money it costs to send food into space in the first place. That’s fairly encouraging! A lot of the food appears to be dehydrated – considering the dynamics of water in space, how easy is it to get the food to mix with water? Do you have special water dispensers that you use?